A team of researchers at the University of Pittsburgh, collaborated with another team from the University of Wisconsin at Madison, to create a transistor, which is just an atomic diameter in size and can be switched on and off by just one or two electrons. 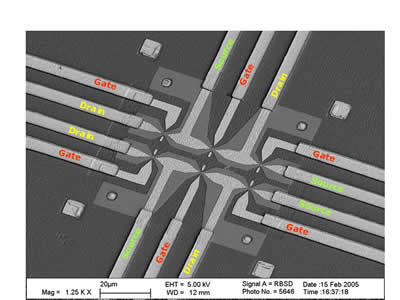 These transistors can further be used as solid state devices, such as fast quantum processors (which might replace the current Si processors) and extremely dense memory devices. Lead researcher Prof. Jeremy Levy of University of Pittsburgh further emphasized that these new materials might be used to create *substances like high temperature super-conductors. The device is basically an island, 1.5 nanometers (nm) in diameter, which is made of metal oxide. This island can house zero, one or two electrons only allowing it to be in very specific quantum states. Such exotic materials have never been made. Nanowires, 1 to 1.2 nm thick, carry electrons across the island, thus allowing conduction. Existent Single Electron Transistors (SET) generally have a size of about a micron, so the miniaturization is a thousand-fold. The idea has been there for a long time. In order to build an SET, Graphene has also been tried. No real success has been achieved so far, primarily because Graphene doesn’t have a strict off state. This becomes crucial when considering transistors switched on and off by single electrons. The wonder of the device is its extreme sensitivity to the presence of an electric charge. Further, the oxide base is ferroelectric and can retain electrons even when the device is switched off. If the number of electrons in the island is controlled, the device can act as a memory device, in some state, 0 or 1. Stacking many such islands together can create an ultra-dense solid-state memory device, which can be altered by passage of minute amounts of electric current. Fabrication in the pure state is a problem currently, but this is usually the case when a new solid state device is made for the first time ever. 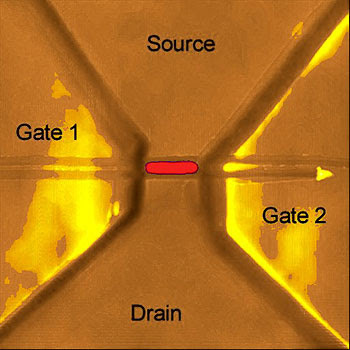 Today’s improved Atomic Force Microscopy (AFM) Techniques allow engineers to fabricate materials directly on the nano-scale with high precision and this is the current line of attack. If made on a commercial scale, these transistors can make a computer out of quantum processors, having unthinkable speeds, capable of performing calculations in a day, which are estimated to take hundreds of years on today’s supercomputers.